The town of Ballina has put out a call for experienced and aspiring pikemen and pikewomen. Make history in the north Mayo capital this weekend by recreating history as part of the In Humbert’s Footsteps festival that is being staged in the town at present and up to next Sunday, June 29. A spectacular battle re-enactment on Sunday afternoon, June 29, is one of the many highlights of this award-winning festival. 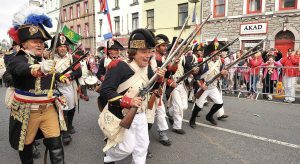 The organising committee needs as many volunteers as possible to take part in the re-enactment of events that occurred locally during the 1798 rebellion when French General Humbert and his troops joined forces with the Irish in a bid to overthrow English rule. The troops will be taking over the Military Barracks (behind Penney’s in the Market Square) from 7am this Friday, June 27 and hope to have the camp in full swing by 4pm. It is essential that all pike people report for duty by 8pm at the latest that evening. Later that night the public will observe a dramatic re-enactment of the torch-lit entry of Humbert and his troops to Ballina. The procession will enter the town via Bohernasup and will conclude at the military barracks at approximately 10pm. On Saturday, June 28 the military barracks camp will be open again from 10am. Pike practice, drills and rehearsals take place from 12.30pm to 5pm that day. The camp swings into operation once more from 10am on Sunday, June 29. The Battle will commence at 2pm but all pike men are requested to be on duty from 12.30-5pm. Volunteer pike men, women and children are encouraged to frequent the barracks as often as possible throughout the weekend as it will contribute to the atmosphere. Local television production company, Gillian Marsh TV will film the activities throughout the weekend for RTE’s Nationwide programme. A French TV company will also record the events and the French ambassador will be in attendance too.